Nestling in the idyllic hills of the Strathearn Valley only an hour's drive from Scotland's major cities, Knock Castle Hotel and Spa offers an oasis of tranquillity a world away from the hustle and bustle of modern living. Formerly the 19th century baronial home of Scottish shipping magnate Lady MacBrayne and now beautifully restored into a small luxury hotel and spa, the Castle enjoys uninterrupted views across the beautiful Perthshire countryside and the historic drover town of Crieff. Enjoy the comfort of one the castle's opulent bedrooms; stroll through three-and-a-half acres of stunning wooded grounds; unwind with the latest spa treatments and therapies; or simply sit at the window in our rooftop lounge and enjoy an aperitif overlooking some of the finest scenery in the world. 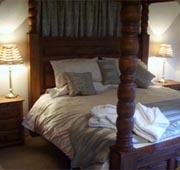 For larger parties, the Castle Lodge offers complete privacy for up to 17 in nine luxurious bedrooms. At Knock Castle Hotel and Spa, the food is exemplary, the wine cellar extensive, and the service from our staff thoughtful, personal and timely. We look forward to meeting you. The gym and pool complex at Knock Castle is situated amidst an oasis of flowers and plants and offers a wide range of facilities including sauna, steam room and spa bath. Experience our heated indoor pool, which enjoys constant warm temperatures and overlooks the Hotel’s wooded gardens, unwind in the spa bath, sauna or steam room or relax on a sun lounger at the poolside. In our Spa, combine traditional facial and body treatments designed to restore balance to stressed bodies and minds, with detoxifying programmes to leave you feeling relaxed, toned, and revitalised, and the latest in technology like The Egg and the VelaShape. 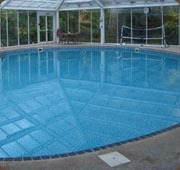 For those feeling more energetic try the facilities our supervised gymnasium has to offer. We have a range of cardiovascular machines and weights available. With many championship golf courses on your door step too, you are close to Gleneagles and St Andrews and a short trip in the helicopter will take you north to Royal Dornoch.